This is prized Blue Lotus Absolute Oil with a high aporphine and nuciferine content. 1 ton of flowers makes just 1 kilo of this precious oil, hence its high price tag. So rare we can only make 100 ml available at a time. Unlike other absolutes that are often made with harsh chemicals, this absolute oil is made in a strictly controlled, sterile environment, leaving no residue behind. This oil has an extremely rich scent and is completely organic. It comes from a single pond on a small farm in Nepal, and despite what others may claim, we are the exclusive manufacturers and distributors for this coveted oil. Truly, this is a product that you have to be absolutely sure of what you are buying. We've seen other ethnobotanical vendors who claim to have true Blue Lotus Absolute Oil, but the plain fact is that we are one of the only vendors who have a true absolute of this sacred plant. Click the link below for a full description of this product, as well as links to more information, uses, and other curious details of one of our favorite plants here. This is prized Blue Lotus Absolute Oil with a high aporphine and nuciferine content. 1 ton of flowers makes 1 kilo of this precious oil, hence its high price tag. So rare we can only make 100 ml available at a time. Unlike other absolutes that are often made with harsh chemicals, this absolute oil is made in a strictly controlled, sterile environment, leaving no residue behind. This oil has an extremely rich scent and is completely organic. It comes from a single pond on a small farm in Nepal, and we are the exclusive manufacturers and distributors for this coveted oil. Truly, this is a product that you have to be absolutely sure of what you are buying. We've seen other ethnobotanical venders who claim to have true Blue Lotus Absolute Oil, but the plain fact is that we are one of the only venders who have a true absolute of this sacred plant. Nelumbo nucifera (Sacred Lotus Petals) have become etched in folklore because of a fabulous people who supposedly occupied the north coast of Africa and lived on the lotus, which brought forgetfulness and happy indolence. The Sacred Lotus flower was also what the Ulysses' crew smoked after coming ashore following years at sea. You can find much more about Blue Lotus, and the often mis-understood differences between Blue Lily and Blue Lotus on our main Blue Lotus/Lily Flowers Extracts & Resins page on our own site, or you can go to one of our affiliates' websites called "The Lotus Shop" (although they don't actually sell any Lotus products at all), or, you can check out the infinitely curious ethnobotanical resource called Entheology, who have their own articles on this rare and sacred plant, one of which is called Nymphaea caerulea - Blue Lily / Blue Lotus. Anyway, Blue Lotus had a wide variety of uses in numerous historical texts, all of which related to pleasure in some way. It was used as an aphrodisiac to promote sexual desire, it was used to create a feeling of well being, euphoria, and ecstasy. This Blue Lotus Absolute Oil is a very specialized and popular product. Out of the hundreds of orders per year that we receive for it, about 50% are massage therapists who add it to their carrier oils and magickal blends to induce multi-sensory experiences for their clients. Yes, the active alkaloids in this absolute oil can be absorbed through the skin, and in a relaxing environment, with soothing music and a warm touch...this product can help induce quite a powerful experience, both physically and spiritually. The other unique use is as a herbal smoking additive. Whatever your favorite smoking herb is...whether it's a single herb or an herbal blend...simply add a few drops of this strong oil to the herbs to heighten and enrich the experience. If you're smoking out of a pipe, simply add a few drops to Not only is Blue Lotus Absolute Oil known for it's own unique effects, it is reportedly a powerful enhancer as well. Products such as Wild Dagga or Three Lotus Paste act as enhancers to other products, increasing and intensifying the effects. 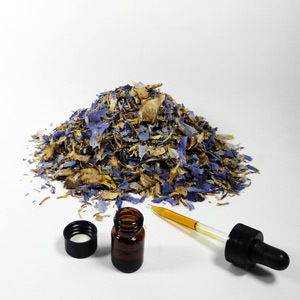 The Blue Lotus Absolute Oil can also be added to an oil warmer for intoxicatingly intense aromatherapy, and some over 21 customers have reportedly used this as an additive to wine, just as the Blue Lotus Petals or the Three Lotus Paste ore used, but we have not tried this ourselves. Oil and wine don't mix too well together, but we pass the information on, and encourage you to leave comments below about your own personal use and experience with this unique product.